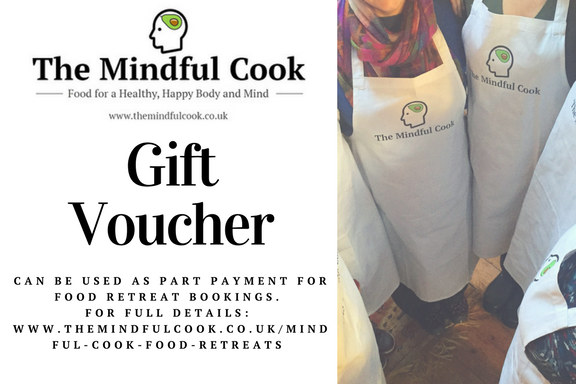 Why not treat someone to a gift voucher from The Mindful Cook that can be used as part payment towards a future retreat? Simply select the required amount from the drop down list below. The £50, £100 and £300 gift vouchers can be used as part payment towards a food retreat booking details of which can be found here. When you buy the gift voucher you will be issued with a code. You can then use the gift card whenever you like, adding the code in the “Coupons” sections of the “Cart” or “Checkout” pages, or simply mentioning the code when you make a booking over the phone. The £50, £100 or £300 gift vouchers can be used as part payment towards a future food retreat.